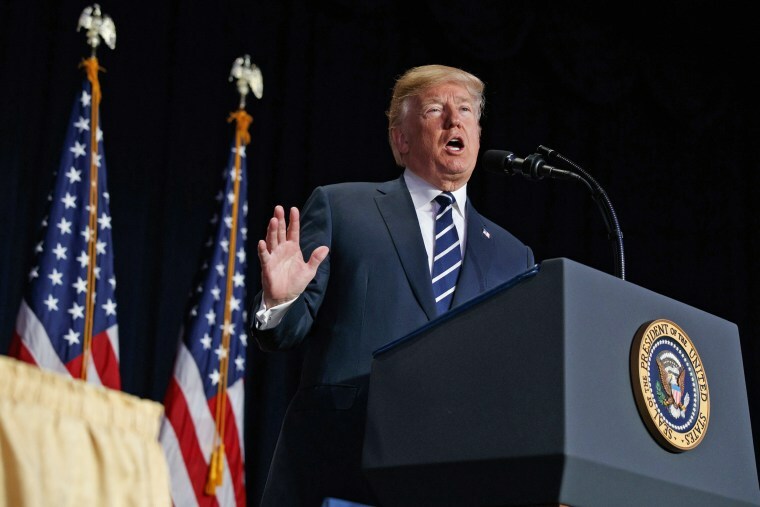 WASHINGTON — The White House will release the principles of President Donald Trump’s long-touted $1.5 trillion infrastructure proposal on Monday — a plan that leans on state and private investment as key, driving factors in financing the effort. The administration's proposal is expected to seek $200 billion in new federal funds, according to a senior administration official, who briefed reporters over the weekend on the condition of anonymity. That includes $100 billion on "incentives" to match state, local and private investment spending on infrastructure projects, and $20 billion for expanding federal loan programs that focus on various kinds of infrastructure (rail, water, transportation). The administration has pushed for public-private partnerships to spur infrastructure action across the United States, even as NBC News has reported that Trump himself is waffling on the funding idea. The plan would also allocate $50 billion for rural infrastructure projects to be distributed as block grants to states, and another $20 billion for "transformative programs" that have an eye toward "next-century-type" infrastructure projects, the official said. Finally, the administration is asking that Congress spend $10 billion on a capital financing fund. "Every federal dollar should be leveraged by partnering with state and local governments and, where appropriate, tapping into private sector investment — to permanently fix the infrastructure deficit," Trump declared in his State of the Union address. Asked how the $200 billion infusion would be paid for, the senior administration official cited "a whole series of places where the administration is suggesting reduced funding” in their soon-to-be-released budget, declining to be more specific than an assurance it would be paid for “out of savings from other areas of the federal budget." The White House is also planning to release its version of the federal budget Monday. In addition, the administration hopes to use the infrastructure plan to address an issue that Trump, a former real estate mogul, has long griped about: the often lengthy permitting process that developers and contractors must navigate before construction can begin. "We want to shorten the permitting process into two years," said the senior administration official, who said that the goal is also to preserve environmental protections as well. Trump complained during the 2016 campaign that over-sensitivity to various plants and wildlife had held up construction of barriers along the southern U.S. border, where he would like to construct a wall. The fix, the administration says, is moving toward what they call "one agency, one decision": directing one federal department to take the lead on permitting actions. Trump is expected to hit the road to sell the plan once its broad contours are released. But the sale he'll really need to make is with lawmakers on Capitol Hill — a fact that administration officials involved in crafting the proposal are keenly aware of. Monday's release, they say, shouldn't be seen as a "take-it-or-leave-it proposal," but the launching point for the deal-making process. "This is the start of a negotiation — bicameral, bipartisan negotiation — to find the best solution for infrastructure in the U.S.," the official said. "We envision this will be a bipartisan push." The push for tax reform began the same way: with the White House publicly bullish about winning Democrats to their cause but, in the end, unable to actually do so. Now, the administration sees "a significant amount of overlap in terms of the objectives" between the White House plan and other ideas floated by Democrats, though the official said that "there's obviously a disagreement of the best way to get to those objectives."